Very important and differentiating reactions! Freshly prepared sulpho-vanillin must be used: Make a mantle preparation in water, cover it with a cover-slip, add some crystals of vanillin at one side of the cover-glass and put a small drop of H2SO4 on these crystals. Be sure that there is contact between the water of the preparation and the dissolving reagent and that there is no acid on the cover glass. The observation should be done permanently through the microscope, because sometimes the reaction is very fast and the preparation is quickly dissolved by the acid. A positive reaction is a pinish to black colouration (with all intergradations) of cell contents, and a red colouration of the hyphal walls. Be sure that you do not misinterpret a red reaction of root cell remnants as a positive reation! The kind of reactions should be noted separately. 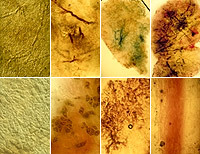 Laticifers of the Lactarius species can be stained exclusively, and/or some cells of the mantle, or laticifers and all hyphal ends on a mantle. Sometimes combinations of bright colours can be caused.